I think I know the answer, but I had to find some good reason for putting these great pics on the blog. 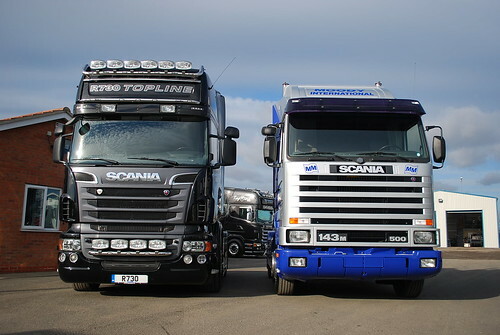 Both trucks are currently for sale with Moody International, so get onto his new and very professional looking website by clicking HERE. If your interested please contact Mick, although I think the 143 is one truck he will be a touch reluctant to say good bye too. 1230hp of Scania V8 power, if I could i’d love to have them both!! The 143 is a true classic and is already becoming a sort after collectors item, which is putting the prices up and up. As for the year old R730, a modern master piece, with what is arguably the best ride of any of the current factory built trucks. Note the V8 620hp Scania Viking in the back ground which unfortunately is now sold! 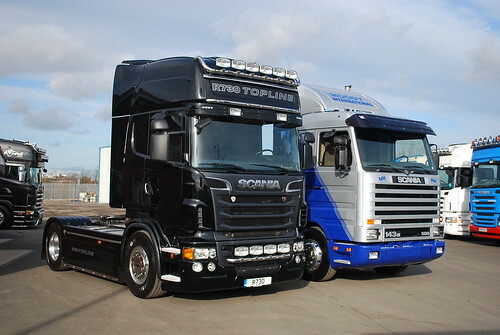 This entry was posted in For Sale, Scania by truckbloguk. Bookmark the permalink.